Home News AskUs.cz: How do I choose the right university? At some point during their high school years, all young people face one big question: should I go to university? One reason to stay in school for four more years is to take the opportunity to build the foundation of a successful career. University students have a unique chance to broaden their worldviews through studying in an international environment and focusing on a subject of their interest. A university-level education will develop a student’s intellectual independence and ability to receive, interpret and evaluate information – not to mention their self-reliance, personal responsibility and a range of social skills. Your university experience will have a lasting impact on your personal and professional life. However, many students select a college based on very few criteria, and sometimes on emotions alone. While relying on your intuition shouldn't keep you from academic success, such an important decision probably requires a higher level of research. You should expect to spend a lot of time browsing through prospectuses, searching for the perfect degree program. During your research, you will want to pay attention to the university's ranking and reputation, but what are the other essential elements which should influence your final decision? 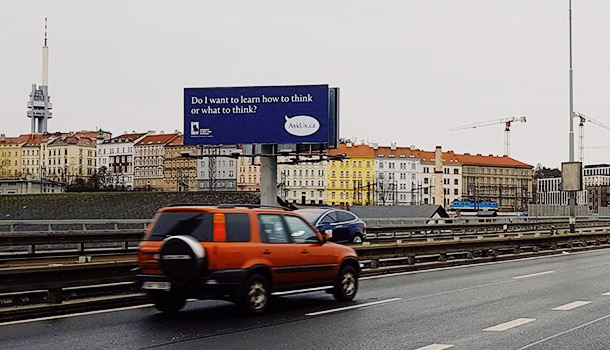 This year, the University of New York in Prague has launched the AskUs.CZ campaign, dedicated to helping high school students to choose their academic paths, regardless of their field of preference. Mark Anderson (Director of Marketing for the University of New York in Prague) is the driving force behind AskUs, and he elaborates on the source of inspiration for a new campaign that blends storytelling and advertising across digital and print channels. M.A. : "Choosing a university can be a stressful time for any young person. They have to consider what they want to do with their future. They have to consider how the choice will impact the next four to five years of their life, what their friends are going to do and most importantly what their parents will think. This is a lot of pressure for someone just 18 years old, so with the Ask Us campaign we wanted to put some of those questions to the forefront and let students know that even if they are not interested in UNYP, they can still ask us and maybe even find some of the answers through us. After 20 years in the Czech Republic, we feel it’s important to be part of the community and offer young people information freely." By asking simple yet powerful questions, UNYP's AskUs.Cz campaign will help you focus on the real reason of pursuing your university degree. We aim to narrow down your possible choices and help you make a decision you won't regret in the future. We are not going to make that choice for you, but we can help you work it out for yourself. The elements that a high school graduate should consider when choosing a university are very personal. However, there are specific vital questions that it’s worth asking because they help you define what university is ‘good’ for you. Private or public, local or international, single or double degree – this list isn’t exhaustive, but it’s enough to get you started. Hopefully, we have been helpful! Remember that choosing the right university is not easy, and you have to be patient. However, it is also necessary to mention that regardless of which university you end up at, you will still have a life-changing, challenging and exciting experience.